My awesome fantasy team, The Green Sox in the MLBloggers fantasy league is set. My rotation and lineups are nice but my bench and relief pitchers are not so hot. I had to leave before I could draft my bench/ relievers so I guess I shouldn’t be complaining. Braves World draft Prince Fielder with the first pick which I though was very interesting. My first two picks were my keepers, Tim Lincecum and Ryan Howard. With my third I was about to draft Mark Reynolds but I had some computer issues and it drafted a former Red Sox left fielder who’s last name is three letters. Ya you probably thought I ment Manny. In the fourth I was going to pick either Javier Vazquez, Chone Figgins, or Josh Johnson. In the end I chose Josh Johnson to go with Tim Lincecum. Then in the fifth I picked Billy Buttler, the first baseman for the Royals who was on my team last year. With the 119th pick I was trying to get someone at DH. I didn’t end up putting him there but I picked Jason Kubel as my right fielder.Then in the seventh I got J.D. Drew’s younger brother Stephen Drew as my starting shortstop. In the eighth I got someone on my team last year. 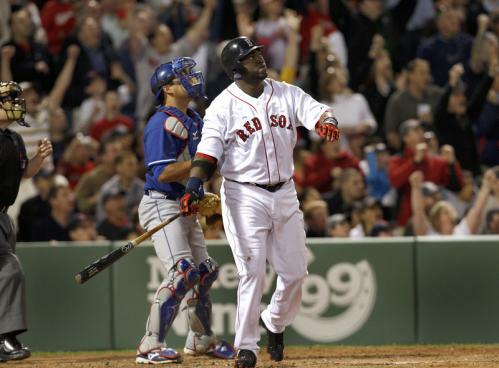 I believe he was a steal for an eighth round pick, On the Boston Red Sox, number 34 . . . DAVID ‘BIG PAPI’ ORTIZ! Now you see why I moved Kubel from DH to right. I think Papi will regain Papi form and hit 35-40 home runs and drive in 100 plus. In round nine I got the former best prospect in the Red Sox, the no-hit kid, Clay Buchholz who is going to win the fifth spot (sorry Wakefield) but is the third man in my rotation. In the tenth I got former Padre Kevin Kooooooouuuuuuuuuuuuzzzzzzzmanoff. I will probably keep him on my roster but I would like Adrian Beltre or Mark Reynolds or even Troy Glaus. Then in the eleventh and twelfth I drafted a pair of Cubs teammates, Geovany Soto and Marlon Byrd. I always though that Byrd should be playing backup but then when I really looked into his stats I wanted him. In the unlucky 13th round I got Dice-K who I think will come back with his 2008 form, when he almost won the Cy Young. In the 14th I drafted a guy who might start the season on the DL, Freddy Sanchez. Sanchez though will do better this year since A.) he is out of Pittsburgh and B.) he is playing with the Giants. In the 15th round my friend came over and since he is an Indians fan I drafted Matt LaPorta who I might use as trade bait. In the 16th I drafted another guy on my team last year (who helped me out by hitting two grand slams in a game), Josh Willingham. In the 17th I drafted yet another guy I drafted the year before, Justin Duchscherer. Only difference is that last year he was not healthy, this year though he is and I can put him under starter, reliever, or pitcher. In the the 18th I drafted speedster, Carlos Gomez. In the 19th I drafted my first reliever, Ryan Madson. Then in round 20 I drafted Nationals ace (you know you team is bad when your ace gets drafted in the 20th round), Jason Marquis. In the 21 round I drafted another bad teams ace, and 2009 all-star Zach Duke. In round 22 I drafted someone ESPN suggested, Eric Young Jr. who will be one of my main stolen base guys. In round 23 I got Nick Blackburn as my last starting pitcher. Then in round 24 I got Blue Jays shortstop Alex Gonzalez. In the 25th I got the Padres, Tony Gwynn Jr.
After that I had to go to the Rodeo which was AWESOME!!!! Something that was not awesome was who I got. I set it up so I could get Hideki Okajima and Ramon Ramirez. I got them I got Chad Durblin, and Gabe Kapler after Okajima and Ramirez. I’ll be honest the only guy I knew out of those is George Kottaras because he use to play for Boston but now plays for the Brew Crew. Ohh well thats what I get for not staying I guess. I need a closer for sure and there are a few players I would like to have had but one things for sure I am winning it all!